Acrylic Crack Patch is a 100% acrylic trowel grade tennis court crack filler designed for filling cracks in asphalt or concrete surfaces. Ideal for tennis court repair and filling of cracks on athletic surfaces. Typically, one gallon tennis court crack filler will fill approximately 75-150 feet of cracks depending on depth and width of crack. 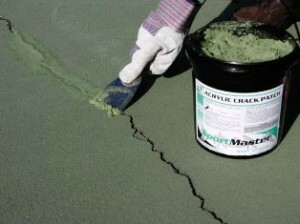 100% acrylic trowel grade crack filler designed for filling cracks and other small tennis court repairs. Acrylic Crack Patch is a tennis court crack filler designed for filling cracks in asphalt or concrete surfaces, up to 1” wide. Small depressions, spalling, and other tennis court repair can also be performed with Acrylic Crack Patch. Product can be used prior to resurfacing or for tennis court repair on an existing acrylic surface. Cracks must be cleaned of dust, dirt, debris including vegetation. Blow clean with air compressor or high pressure washer. Use product as is. Do not dilute. Work Acrylic Crack Patch down into crack using rectangular trowel or hand held scraper. Wipe off excess material with damp cloth before it dries to prevent material buildup on court surface. Stir material thoroughly before using. Temperatures must be above 50ºF both during application and for a period of 24 hours after application. For more information on tennis court repair and tennis court crack fillers, send us an email or call your local SportMaster distributor. View in Catalog 1 gal. Pail 17 lbs.